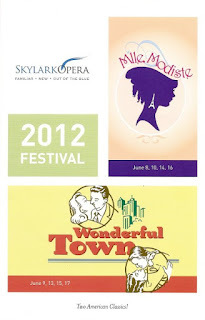 This is my second year attending Skylark Opera's summer festival, and I quite enjoy it. It introduces me to classical musicals that I've never seen (or in this case, heard of), which is a great thing for my continued musical theater education. Skylark follows last year's On the Town with another classic Bernstein/ Comden&Green collaboration - Wonderful Town. 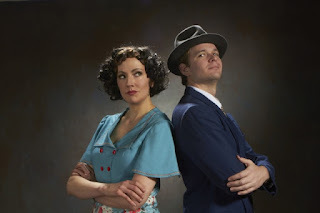 In addition to the similar names, both are traditional musicals set in New York City, with slightly dated stories but great music (you really can't go wrong with a Leonard Bernstein musical). This year's show features many of the same actors as last year, which in this case is a good thing. It's another well done production of an American classic. I'm afraid Sarah Gibson is being typecast as the 1940s tough broad after playing a similar role last year and this. But she's so great at it! Her Ruth is my kind of heroine - a tall, strong, independent, capable woman (who therefore knows "One Hundred Easy Ways" to lose a man). ... including the amusingly diverse trio of the newspaper man Bob (Gabriel Preisser, who sounds beautiful on "A Quiet Girl" and "It's Love"), the nerdy Frank (Paul R. Coate), and the slimy Chick (Riley McNutt). Last but not least, the fabulous score: clever, catchy, beautiful, silly. I only knew one song, the gorgeous duet performed by the sisters - "Why oh why oh why oh, why did I ever leave Ohio?" (Thanks to Sue Sylvester and her mother, Carol Burnett.) Oh how I love a great big pit orchestra sound!